The Mono M80 bass case is among the lightest, thinnest, strongest, most versatile carrying solutions for the professional bassist. It's a hybrid case featuring an ultra light laminated foam shell with strategically placed ABS panels, providing an unmatched level of protection for your most prized investments. Smart features like the Clip/Tuck straps make for easy airport travel, while the streamlined profile helps you slip through the crowds. It fits standard bass guitars from Fender, Ibanez, Warwick, Tobias, and Yamaha to name a few. Inside the Mono case, the patented neckbrace design suspends the bass guitar's headstock, protecting it from impacts that could otherwise snap the neck. An oversized velcro strap quickly secures the neck against a specialized high-density foam block, which also keeps the tuning pegs away from the sides of the case during transport. On the bottom of the case the bass's strap pin is protected by a bumper system of high-density foam, industrial rubber and ABS "feet," diverting impact up and around the body of the electric bass on vertical drops. Constructed with high-tech materials and triple reinforced stitching this bass case is extremely durable. 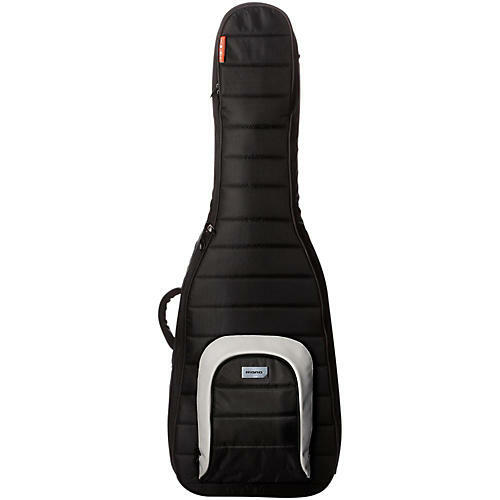 The M80 bass guitar case features a waterproof outer shell, steel riveted handle and shoulder straps, industrial rubber "sole" and piping, and oversized ergonomic zippers. Wear it well. Bass guitar: max depth 3"
Internal width upper bout: 12-1/2"